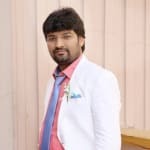 Dr. S.Md Rafi is a popular Physiotherapist in Kamalangar, Hyderabad. He has over 13 years of experience as a Physiotherapist. He is a qualified PG Diploma In Manualtherapy, Diploma in MFR, Fellowship in Cardiac Rehabilitation, Fellowship in Orthopaedic Rehabilitation (FOR), MSPT (Master of Physical Therapy), M.D (A.M), BPTh/BPT . He is currently practising at GENESIS Multispeciality Clinic in Kamalangar, Hyderabad. Save your time and book an appointment online with Dr. S.Md Rafi on Lybrate.com. Lybrate.com has a number of highly qualified Physiotherapists in India. You will find Physiotherapists with more than 42 years of experience on Lybrate.com. Find the best Physiotherapists online in Hyderabad. View the profile of medical specialists and their reviews from other patients to make an informed decision. Hi I am female, 56, I feel pain in my shoulders, I have spondylitis. Last year I feel pain in my shoulder. doctor detected as frozen shoulder, I underwent exercises and yoga for that. But again I feel pain in my arms, shoulder. I am diabetic. And also have problem of hypertension. Kindly guide me. Hi, - Frozen shoulder is common affect to diabetic patients. - prolong spondylitis case may cause pinched nerve at neck region, that pain will radiate to shoulder, arms till finger tips of hand. My advice: -Full range of motion exercises at least twice/day (Neck & Shoulder) -Strong Neck isometric exercises at least Twice/day (Pain free) -Strengthening Exercise for Shoulder/Shoulder griddle muscles -PNF exercises -Scapular movements/ Shoulder griddle movements -Stretching exercises at least twice/day -Towel exercises -Free ROM exercises of Shoulder Precautions -Maintain good posture/avoid Bad posture -Avoid jerky movements -Avoid keeping you r neck straight and stiff -Use soft collar/cervical pillow -Do not sleep over affected side -If you are working long hours you must relax the muscles of you r neck and shoulders by taking frequent breaks. It can help to relieve Pain -Apply Ointment -After 10mins Ice therapy for 20-30 mins daily twice (Mor/Night) NOTE: Orthopedician/Orthopedic Physiotherapist Helps you lot… TAKE CARE…. There are some problems in my waist someone says that a small gap is created between two bones in waist. What should I do now? Please help me. I feel very much pain for this. I can't seat, can not walk freely. Hi, how can you believe if some one says. Do you have any evidence? my advice: take x-ray of you r ls region, views are 1. Ap view 2. Lat view home advice -take rest for maximum time -avoid long sitting, standing, walking -if you want to travel for long time use gel bed in you r car -start back strengthening exercises & stretching exercises -do not sleep on soft bed, try to sleep on floor -apply any pain killer ointment precautions -maintain good posture/avoid bad posture -use ls belt if necessary (do not use for long time) -if you are working long hours you must be relax by frequent breaks. -maintain ideal body weight -have a balanced diet food. Respected sir, I am 25 years old one week ago I played volleyball then my ankle twisted so I have much more swelling that is not less so what I do pls. 1. Apply elastic crepe bandage to ankle joint 2. Keep lime in elevated position 3. Ice therapy for 30 mins 4. You can use any ointment 5. Rest for 3 days 6. X ray of ankle joint if not subside with above treatment take care. Hiii good morning Dr. I am suffering from back pain 3 year muscular pain so uske liye mujhe kya karna chahiye me exercise karti hu or muje kya Karna chahiye pls tell me doctor. 1. Avoid long standing, sitting, walk. 2. Take rest for max time 3. Do not use mattresses to sleep, sleep on floor for some days 4. You can use painkiller ointment 5. Do back strengthening exercises 6. Avoid bare foot walking 7. X ray will help to find cause of pain take care. Since I am a sales promoter of a mobile company, I need to stand maximum time and because of that I am suffering from back pain. What remedies I need to take to avoid suchbpain? Precautions: 1. Use soft gel soles in you r shoes. 2. Take rest for 1-2mins after standing 5-10mins. 3. Do back strengthening exs daily at least twice/day. 4. Stretching exs 5. Do not transfer you r body weight equally to both limbs during standing period. Take care.